This year, Universities are working hard to change the narrative around mental health and make mental health and wellbeing a university-wide priority. It is all about the power of using your voice that we can use to shape the future of student and staff mental health. There are over 2.3 million students studying in UK universities, with many of these students experiencing academic, social and financial pressures. Being at university can raise a number of unique challenges to student mental health and wellbeing. With an increasing number of students accessing support services, an increase in the severity of distress and mental illness in young people, students leaving university due to mental health difficulties and, tragically the number of student deaths by suicide, we believe it does not need to be this way. The mental health and wellbeing of university staff is equally as important. There are over 419,000 professional services and academic staff employed in UK universities. Increased workloads, poor work-life balance, pressure to meet targets, pastoral care, low work morale and job insecurity may not necessarily be unique to higher education staff, but they do contribute to high levels of occupational stress and poor mental health in the sector. That is why there are many ways we can work together to achieve change. Whilst awareness is increasing, there is a lot more to be done to address the existing gaps in knowledge. Staff and Students understand the challenges that university presents and are best placed to influence change. We see your experience as central to the solution of improving mental health at our universities. We all have mental health, we all have stories to share and we all have the power to shape the future of student and staff mental health. Therefore to support this aim, staff and students from across our campus are working together to take part in a number of activities that will raise awareness and funds that will be invested back into supporting mental health for Loughborough University London students and staff. All donations go towards supporting activities suggested by staff and students only. Activities will be taking place on campus all day on Thursday 7 March and this includes a sponsored face paint, doggy de-stress, pet therapy and a raffle. The sponsored face painting consists of one lecturer from each Institute getting their face painted. This includes Professor Mikko Koria, Dr Louise Scholes, Professor Helen Drake, Professor James Skinner, Dr Ece Algan, Dr Yogachandran Rahulamathavan and Dr Jukka Rintamäki. Donations can be made now until Friday 8 March. You can also de-stress by booking yourself a 15-minute slot for doggy cuddles! Book now to avoid disappointment. It will be a fantastic day so make sure you get involved! Further details on the event can be found on our Events page. 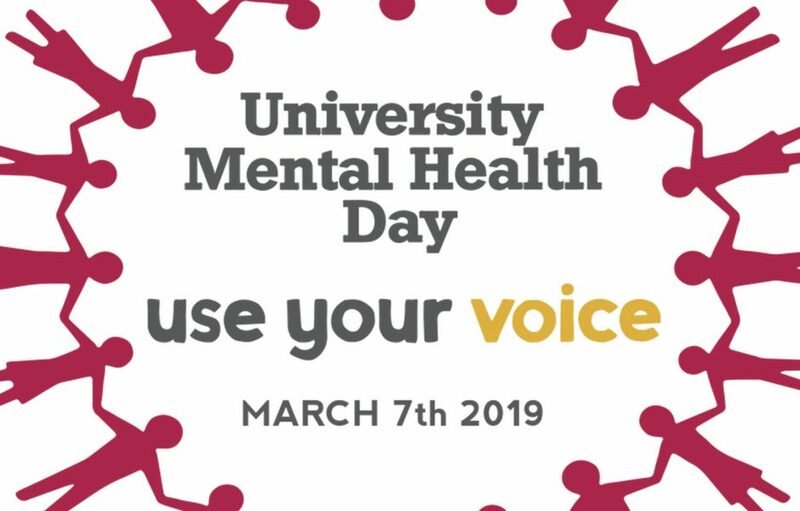 There are many other ways that you can get involved and use your voice to support University Mental Health Day. This includes sharing your story or words of encouragement on social media using the hashtag #UniMentalHealthDay or by sharing your experiences with others in a blog. Please email us at london@lboro.ac.uk if you would to write a blog for us.